"BAY BLISS" - Near Jetty Road with pool. Beautiful and glamorous 3 bedroom home in the heart of Glenelg. 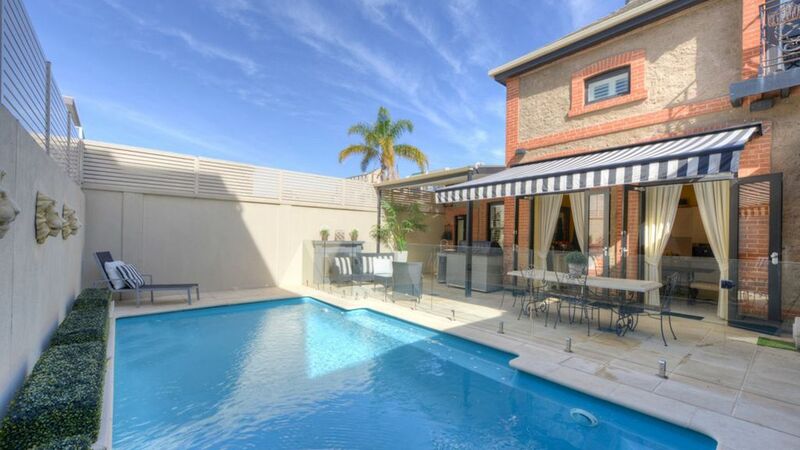 A stunning house in the heart of Glenelg, 2 bedroom + study/3rd bedroom, 3 bathroom +solar heated swimming pool. Fantastic location - set one street from the beach front and Jetty Road (next to the Stamford Grand). Bay Bliss is set up for the perfect beach/romantic getaway or short/long term executive rental. A very private and exclusive house. Approx 20 minutes to the city, 10 minutes to Adelaide Airport and a leisurely stroll to the trendy local cafes, restaurants and shopping area of Glenelg. For the AFL football fans it is just a short tram ride into the city to the new Adelaide Oval - tram located almost at your door step! This stunning house accommodates up to 5 guests and features 2 bedrooms plus a 3 bedroom/study with a sofa bed, 2 main bathrooms and an outdoor bathroom. The office/study overlooks the pool area with French doors that open up to the solar heated swimming pool that is fenced off with a glass barrier and an outdoor kitchen/BBQ area. Enjoy a swim during summer in the solar heated outdoor pool or sit back and relax in the splendour of the outdoor furniture provided. The swimming pool is solar heated which means that it is weather dependent. A perfect place to have a holiday and also ideal for the executive who needs an office with free Wi-Fi. No expense has been spared in the furniture and fittings throughout the house. On the first level there is an open plan living room with adjacent dining area that seats 6 guests with French doors that flow outside to the fantastic entertaining area with built in kitchen/BBQ. Sensationally appointed kitchen area with Miele appliances including a convection oven, double door fridge, dishwasher, microwave, washing machine and dryer. Foxtel and Internet connection is available. The exquisite master bedroom is upstairs and has a king bed with flat screen TV and an ensuite that has a designer bathroom with stand alone bath tub, shower, double vanities and his/hers dressing room. French doors from the bedroom open up to overlook the solar heated pool below. The second bedroom is downstairs and has a queen bed, its own bathroom with shower. The third bedroom/study has a sofa bed. A short stroll to the beach. The house is situated in trendy Glenelg where you can feast in some of South Australia's finest restaurants and trendy hotels. Nearby golf courses include Grange, Royal Adelaide, Kooyonga, West Beach and Glenelg. This property is managed by Elite Accommodation- A licensed real estate agent based in Adelaide. This pool is solar heated- please note it is not gas heated and therefore will only stay warm during the very hot days in summer. A beautiful house in a Great Location that you can walk to everything. the house was amazing and exactly what was in the pitures but upon arrival there were no spare keys so we had to use the ones that were in the lock up box, also there were 5 remotes for the one tv setup so a bit of instructions in how to use everything would have been very helpful and also the hot wat was turned off after a couple of quick phone calls someone came and turned it on it was so simple that if it happened again a quick instruction sheet on how to do so would have been easier, i say this because there were instructions on everything of what to do and what not to do which made me a little paranoid in how we left the house which i left quite clean, alos the outside heater was not working so wasent available. other than that the house is in an awesome spot so made it very easy to walk to shops and restaurants. Our second time in this property. Just perfect.